Here’s the thing about going to the International Space Station: No one can predict what you’ll need to do during your six-month stay there. Maybe something breaks and you need to go “outside” to fix it, in a spacesuit. Maybe you’re going to spend a day or three in a cramped corner, fixing something behind a panel. Your body needs to be able to handle these challenges. And a big key behind that is regular exercise. To get ready, you need to change things up frequently on Earth. Weights. Kettleballs. Pull-ups. Squats. Deadlifts. Interval training on cycles and treadmills. And more. “Preflight, we throw everything but the kitchen sink at [astronauts],” said Mark Guilliams, a NASA astronaut health specialist who gets them ready before orbit. “We try to work as many different movements, using multiple joints and as many different planes of motion as possible “. Some astronauts hit the gym every single day, such as the enthusiastic Mike Hopkins who did a whole YouTube series on exercising in orbit during Expeditions 37/38 earlier this year. Others prefer a few times a week. The astronauts also receive training on how to use the exercise devices they’ll have in orbit. Because time is precious up there, even when it comes to preserving your stamina. Now imagine yourself in a weightless environment for half a year. Many of the exercises you do on the ground are impossible, unless you make certain modifications — such as strapping yourself down. 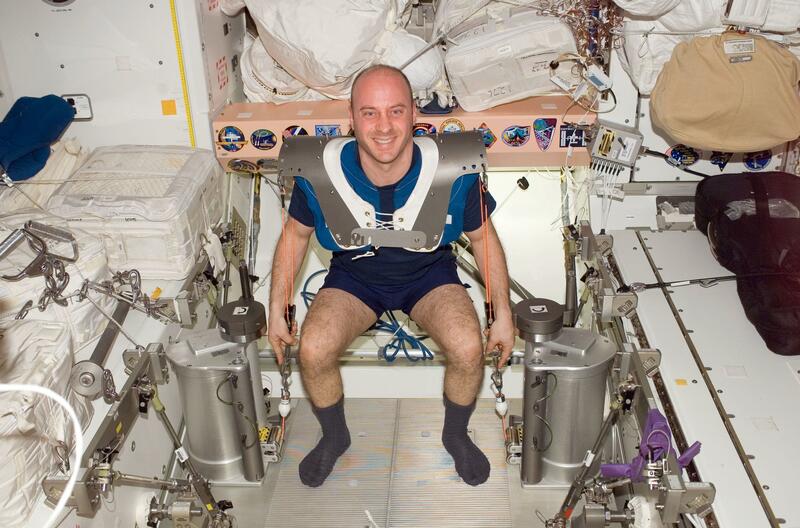 Nevertheless, to make sure astronauts’ physiological systems remain at healthy levels, the space station has a range of gym equipment and the astronauts are allotted 2.5 hours for exercise daily. That sounds like a lot, until you start factoring in other things. Setting up and taking down equipment takes time, such as when the astronauts harness themselves to the treadmill to avoid floating away. The resistance exercise machine has to be changed around for different exercises. This means that their “active” time is roughly 60 minutes for weightlifting and 40 minutes for aerobic, six days a week. Compare that to what is recommended by the American Heart Association– 30 minutes, five days a week for light aerobic activity and two days of weightlifting — and you can see the time astronauts spend on exercise is not unreasonable. Also remember that the rest of the day, they have no gravity. Treadmill stats show the astronauts take only roughly 5,000 to 6,000 steps each day they use they use the treadmill, compared to some people’s goals of reaching 10,000 steps a day on Earth. “When you compare the actual time the crew spends on exercise to that recommended by the AHA, it’s not a significant portion of their day that we’re asking them to participate in order for them to try and maintain their physiological health,” said Andrea Hanson, an exercise hardware specialist for the space station. So what’s the equipment the astronauts get to use? The pictures in this article show you a range of things. There’s the Cycle Ergometer with Vibration Isolation and Stabilization System (CEVIS) — a fancy name for the exercise bike. It has remained pretty much the same since it was brought to the space station back in 2001, for Expedition 2. Its major goal is to keep an astronaut’s aerobic capacity up for demanding spacewalks, which can take place for up to eight hours at a time. The weight device has changed over time, however. The initial Interim Resistive Exercise Device used rubber to provide the resistive force and ended up being not enough for some astronauts, who found themselves reaching the designed capability limits long before their missions ended. (Here’s a picture of it.) Astronauts stopped using it after Expedition 28 in favor of the advanced Resistive Exercise Device, which instead uses piston-driven vacuum cylinders. “The new device actually enables us to go up to 600 pounds of loading,” Guillams said. The IRED device could only give 300 pounds of resistance. So now, even the strongest astronaut can get a challenge out of ARED, he said. By the way, the new treadmill (T2) is called the COLBERT, or Combined Operational Load Bearing External Resistance Treadmill. It’s named after comedian Stephen Colbert, who in 2009 had his viewers vote to attach his name to a space station module when NASA held an open contest. When “Colbert” won, NASA elected to name the treadmill after him, and called the module Tranquility instead. 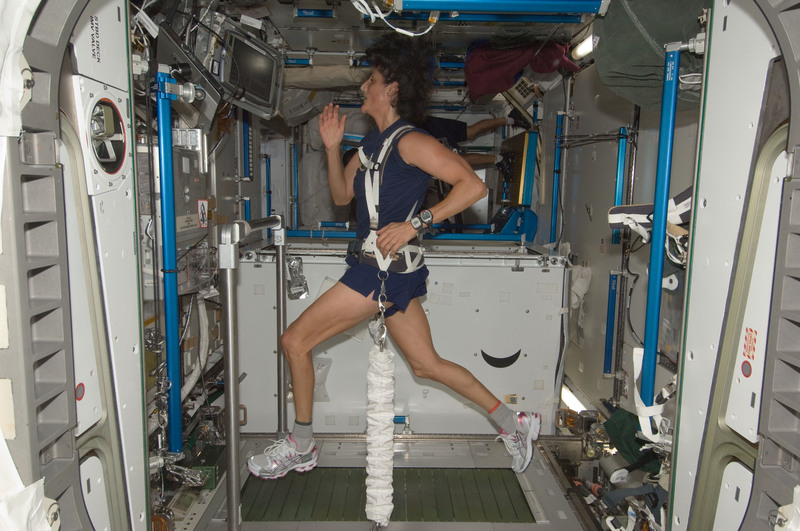 Whatever the treadmill’s name, the goal is to maintain astronaut bone and cardiovascular health while in orbit. A future story will deal with some of the scientific results obtained from more than a decade of ISS science in orbit. 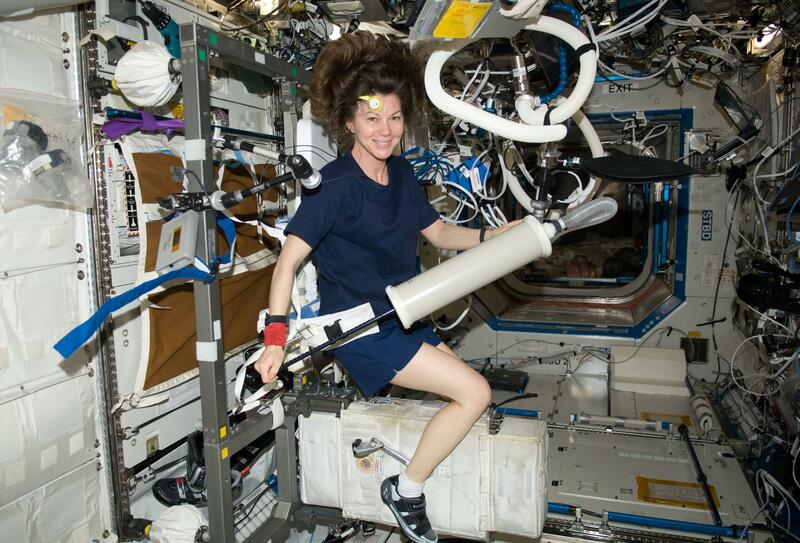 This is part of a three-part series on astronaut health. Yesterday: Why human science is so hard to do in space. Tomorrow: How do you fight back against space health problems?